LeSean McCoy had an All-World rushing season last year, racking up 1300 yards and 17 touchdowns, good enough for best in the NFL in DYAR, by far. McCoy is also a more complete player than most other backs. His pass blocking has, by all accounts, improved significantly since he entered the league. And out of the backfield, McCoy has caught 166 balls over the last three seasons — third-most among all running backs. Despite all those catches, however, there still seems to be room for improvement in the receiving department. While McCoy has already met or surpassed his mentor’s rushing ability, Brian Westbrook was a much more natural receiver. In fact, he was probably the best wideout the Eagles had for a number of years there. At a basic level, Westbrook averaged 8.9 yards per catch over his entire career. McCoy has only managed 7.3 yards. That’s a large difference, although it’s hard to tell exactly why McCoy is deficient in that area. For starters, McCoy has always been targeted more in the backfield. Most of those are swing passes, screen passes, and shovels. However, at least until this year, he was also turning those passes into bigger gains. There’s an interesting trend, which may or may not be significant, where McCoy’s screens have become less effective each season while his receptions on pass routes past the line of scrimmage resulted in bigger gains. So that’s interesting. But in order to get any context for those numbers, we have to compare them to other running backs. I averaged the 2011 reception figures for five comparable backs: Darren Sproles, Ray Rice, Chris Johnson, Arian Foster, and Matt Forte. In many ways, these backs had the opposite production of McCoy. Most of their receptions came from routes past the line of scrimmage, not screens and swing passes. They were also more effective running those real pass routes than McCoy, with an average of 10.8 yards per catch beyond the line of scrimmage. Granted, the reason McCoy runs few wide receiver-type routes is because he’s so valuable in the backfield — even as a decoy. But that’s true about these other running backs as well. One way McCoy can take his game to the next level would be to apply himself this offseason to becoming a better route-runner and receiver when put in motion out of the backfield. That extra element made Brian Westbrook a multidimensional threat, and McCoy would be wise to follow in his footsteps. 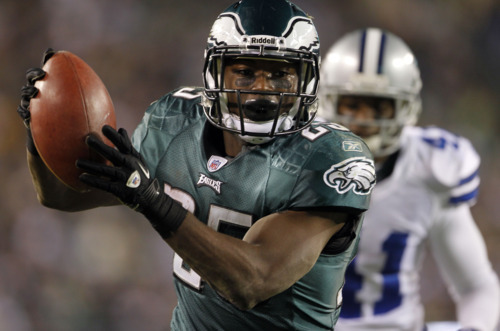 Tagged with Philadelphia Eagles, NFL, LeSean McCoy, Brian Westbrook, Running Back, Receiving, DYAR, Pro Football Focus, Screen Pass, Statistics. February 13, 2012 by Brian Solomon.